Save 75% on a must-read for any lover of taut, suspenseful fantasy! 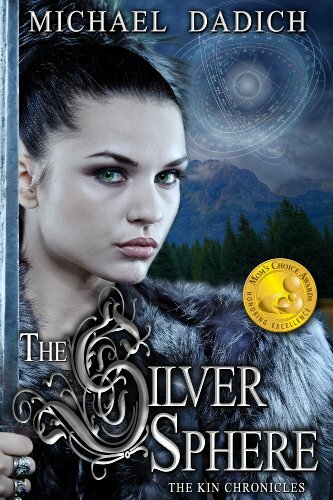 The Silver Sphere (The Kin Chronicles) by Michael Dadich – Just 99 cents, with 4.7 Stars on 92 Reviews! Winner: Mom’s Choice Gold Award for Young Adult Fantasy. Winner: Reader’s Favorite Gold Award for Young Adult Fantasy/Sci-Fi. Winner: Wise Bear Books Gold Award including best in category for Young Adult Fantasy-Adventure and Young Adult Fantasy-General. Winner: Orangeberry Virtual Book Expo’s Award for Best Fantasy. Shelby Pardow never imagined she could kill someone. That’s about to change. All she wants to do is hide from her troubled father… when she is teleported to awaiting soldiers on the planet Azimuth. Here she is not a child, but Kin to one of the six Aulic Assembly members whom Malefic Cacoethes has drugged and imprisoned. He seeks to become dictator of this world (and then Earth by proxy).